II. FILL 'ER UP! The university is not committed to learning or education. 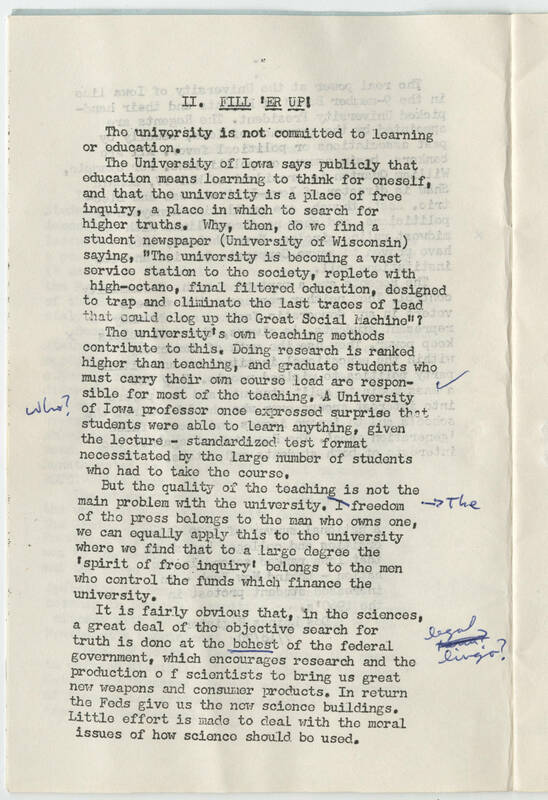 The University of Iowa says publicly that education means learning to think for oneself, and that the university is a place of free inquiry, a place in which to search for higher truths. Why, then, do we find a student newspaper (University of Wisconsin) saying, "The university is becoming a vast service station to the society, replete with high-octane, final filtered education, designed to trap and eliminate the last traces of lead that could clog up the Great Social Machine"? The university's own teaching methods contribute to this Doing research is ranked higher than teaching, and graduate students who must carry their own course load are responsible for most of the teaching. A University who? of Iowa professor once expressed surprise that students were able to learn anything, given the lecture - standardized test format necessitated by the large number of students who had to take the course. But the quality of the teaching is not the main problem with the university, The freedom of the press belongs to the man who owns one, we can equally apply this to the university where we find that to a large degree the 'spirit of free inquiry' belongs to the men who control the funds which finance the university. It is fairly obvious that, in the sciences, a great deal of the objective search for truth is done at the behest of the federal legal lingo? government, which encourages research and the production of scientists to bring us great new weapons and consumer products. In return the Feds give us the new science buildings. Little effort is made to deal with the moral issues of how science should be used.